The Company Folders website (including our Folder Design Gallery) receives over 100 thousand visitors each month. Very few of those visitors are just looking to see some pretty artwork; they want to learn valuable printing tips, request pricing quotes, place orders on presentation folders and more. This means that when clients visit the Gallery, they’re either looking for design inspiration or want to hire a graphic artist with the skills and talent they need. Submitting a design is absolutely free. If your design is approved by our editor, you will receive a page exclusively highlighting your design and your own designer profile page (see the “Mr. Systems Die-Cut Pocket Folder” designed by Mighty 8th Media for examples). 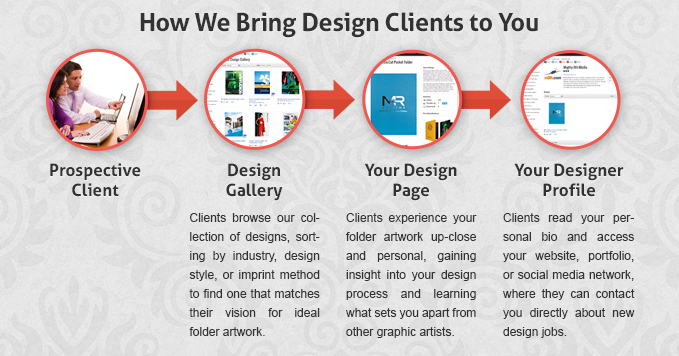 Potential clients who visit the Gallery will see your folder design, personal background, and links to your website or social profiles, allowing them to hire you directly based on the excellence of your work. When you submit a design, you’ll also be automatically entered to win our yearly folder design contest, giving you a chance to win even more exposure. The winner receives a featured interview on our blog, where they can share deeper insight about their work and experience with a larger audience. When it comes time to print the finished collateral for a design job we helped you acquire, we hope that you will return the favor and choose Company Folders as your printer. It’s designers like you that keep the Folder Design Gallery completely free for both artists and their employers. Since our Folder Design Gallery is brand new, we’ve jumpstarted it with several hundred designs from our past clients over the past 10 years, along with about 20 designs that we created ourselves. On top of that, we upload free design templates every week to help inspire and support the design community. We only accept folder designs of the very best quality and visual appeal. Please browse our gallery to get an idea of the type of designs we like to feature. Don’t, however, try to copy someone else’s style or use someone else’s design as a template. We want something original and uniquely you. Finalized designs only, please. No sketches or concept ideas will be approved. The images you send should include views of the folder from multiple angles, including the cover, interior and back. Be sure to proofread for any errors, including typos, improperly embedded images, or incorrect positioning. Go through our design cheat sheet to catch any inaccuracies before you submit. Designs must not contain any copyrighted material (including but not limited to company logos, photos, or slogans) for which you do not have the proper license to use. By submitting your design, you certify that it is entirely your own work and that you possess all of the rights associated with its distribution. We reserve the right to make modifications to your design or writing before placing it in our online showcase. Pictures of your design. The width of each picture must be exactly 600 pixels. The name of your design. Description of your design. Please try to include its purpose and how that purpose was achieved. Your imprint method, stock, and coating. Attribution, non-commercial and no derivatives – Users may share your images for non-commercial purposes as long as they credit you and do not alter their content. Attribution, no derivatives – Users may share your images for commercial or non-commercial purposes as long as they credit you and do not alter their content. Attribution, non-commercial – Users may share and alter your images for non-commercial purposes as long as they credit you. Attributon – Users may share and alter your images for commercial or non-commercial purposes as long as they credit you. All rights reserved – Users may not share your images in any form for any purpose unless they have your express permission. We review all submissions very closely. If we like your design, we’ll contact you with feedback and more information about placing it in our showcase. If you don’t hear from us after two weeks, then your submission has not been approved—but feel free to reapply with a new design.